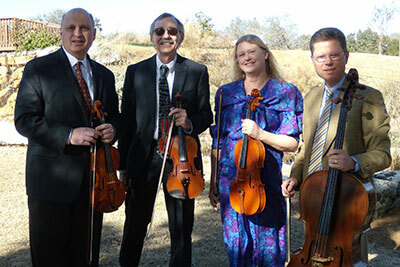 Welcome to the Allandale Quartet web site. If you are looking to add a touch of class to your next social event, take a moment to look over what other people have said about us. You will see their comments below. Please click on the links to see some sample play lists and enjoy listening to some audio samples. We are willing to perform within a 30 mile radius of Austin. Let us know how we can help you enhance your special event. "I am very pleased with everything about this group! They claim that they are not professional musicians, but they certainly are comparable to some of the other quartets that are MUCH more expensive! Another thing that I definitely must brag about is that Sue was able to do an arrangement of a particular song I wanted played during the seating of the mothers. It is so wonderful to be able to hear to certain songs that move you being played during one of the most important events of your life!" "Thanks for recommending Allandale String Quartet. I went and hear them play last night and loved them!! Their first piece for us was Pachelbel's Canon in D and when I got goosebumps, I knew they were the ones!!" "I too am using Allandale String Quartet for my outside wedding. I attended one of their rehearsals and they are great. They are reasonable too. So reasonable that I have hired them to play during my cocktail hour and dinner!" "I checked on about 5 string quartets. I've hired the Allandale Quartet. I attended a practice session. I thought they played well. I am a trained classical pianist." "I submitted a rave review on Allandale back in May. Personally I think I'm getting really good musicians for a steal."